If there is one thing the New York Mets will be remembered for in 2018, it is their ability to exceed expectations in every worse way possible. Every single time you think it can’t get worse for the Mets, they find a way to prove you wrong and make you question their right to be a professional baseball organization. It is clear that the ownership does not care about winning and if this past week didn’t show you that, nothing will. From plummeting after their 11-1 start, their Manager Mickey Callaway mismanaging the team, injuries being swept under the rug by everyone, all the way to the broadcasters burying the team on the Wilpon’s own television network, it can’t get any worse right? 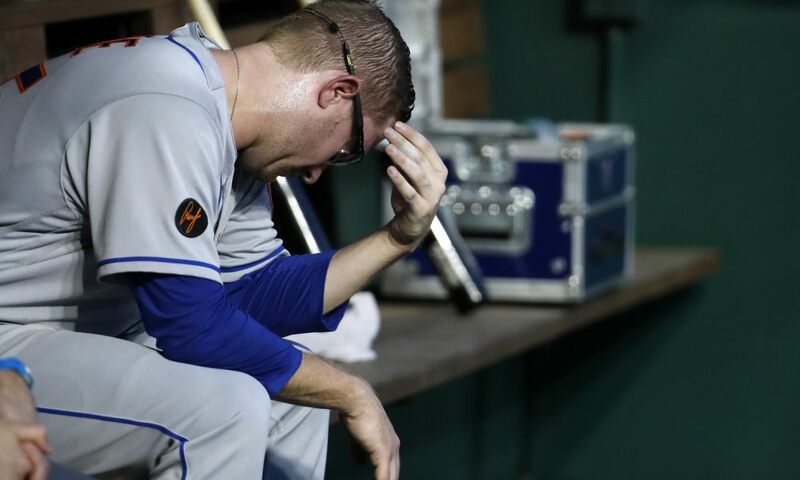 Not only did the Mets refuse to sell at the deadline and rebuild the right way, but on the same day, they suffer their worst loss in franchise history. You could say the timing was predictable, and it is, but I like to call it deserving. It’s time for Commissioner Rob Manfred and the league to step in and force the Wilpons out of the organization. Until that happens, the Mets will be a repeating cycle of failure and misery. It was no secret the Mets had to be sellers. The current product on the field was just not working. The World Series window closed three years ago and it was time to start over. Many figured it would be Zack Wheeler, Steven Matz, Jeurys Familia, Asdrúbal Cabrera; with the possibility of dealing Brandon Nimmo and possibly Jacob deGrom and/or Noah Syndergaard for prospects that would be the future of the organization. Instead, the only two moves the Mets made were dealing Familia to the Oakland Athletics and Cabrera to the Philadelphia Phillies. In typical Mets fashion, they could have got better prospects in these deals, but Assistant General Manager John Ricco didn’t want to absorb their salaries, even though he promised the fans that he would if it meant better prospects. It’s amazing that the Mets’ best reliever and most productive hitter were traded for guys that will either never see a big league field or be failures when they do step on one. The biggest shock of them all came in a tweet from Buster Olney just one day before the trade deadline, and it revealed the Mets’ plan to not rebuild, but instead, contend in 2019. Mets will keep deGrom, Syndergaard through deadline b/c they don’t want to rebuild–which is also part of reason why they aren’t lowering price on Wheeler. They intend to contend next year, and will need to round out their rotation, and looks like Wheeler will be part of it. Not only do the Mets refuse to rebuild, but now, their best reliever and best hitter are on teams contending for the postseason and the Mets have to continue without them. The biggest thing that bothers me with this statement is the idea that the Wilpons, Ricco, and everybody in the front office actually believe the Mets will be competitive in 2019. First off, they weren’t going to win next year anyway. When you have a starting rotation that can’t stay healthy, an anemic offense that will pretty much look the same next year, clueless management that will most likely stay put, and owners that don’t care, that does not spell a championship contender. What fans were looking forward to in 2019, was seeing if these prospects they were supposed to get at the deadline were going to pan out. Now, fans will never have that opportunity, because their clueless owners believe that the Mets will go from worst to first next year. While the Mets have been a laughing stock this season, they would have been praised at the trade deadline if they dealt the right guys and got great value in return. Instead, they get nobody back for their two best trade pieces (next to deGrom and Syndergaard) and their owners act like there isn’t a problem in front of them. On the same day the Mets refused to sell by telling their fans they will be back next year, the Mets suffered a loss only suitable for them. A 25-4 loss to the division rival Washington Nationals, which was their worst loss in the history of the entire franchise. Gary Cohen, Keith Hernandez and Ron Darling read excerpts from the Mets media guide during the team’s 25-4 loss to the Nationals About Major League Baseball: Major League Baseball (MLB) is the most historic professional sports league in the United States and consists of 30 member clubs in the U.S. So that brings us to right now. Where Do The Mets Stand? Unfortunately, as much as they need to rebuild, fire their Manager, bring in a GM from the outside, and much more, the reality is, they don’t need to do any of that. The reason I say that is because one thing needs to be done before all else, because nothing will fall in line until this move is done. Until the Wilpons no longer own the team, there is not one player, not one manager, and not one front office executive that is going to turn this team around. In order for the Mets to one day be successful again, the league has to do what they did to the Los Angeles Dodgers and former Owner Frank McCourt back in 2011: force the Wilpons to sell the Mets. Until the Mets are sold, get ready for endless failure and disappointment. Lets face it, the Mets are now what the Chicago Cubs used to be, the one difference is the Mets aren’t lovable, they are just losers. Follow me on Twitter @SMMcChesney to see all my Mets discussion during the 2018 season as well as get involved in the discussion.